Baby, it’s cold outside! 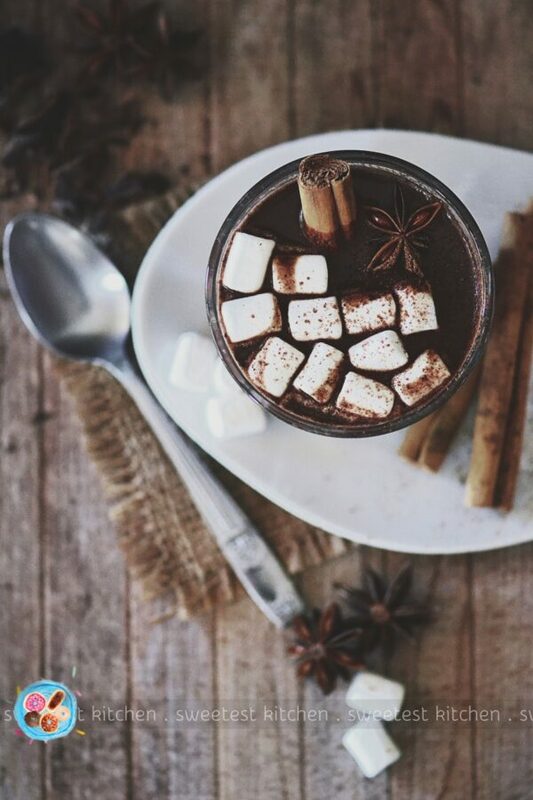 Grab a mug of this chai hot chocolate and gather round a warm, crackling fire for the ultimate winter-warmer! When it comes to my daily caffeine hit, I am a creature of habit. Cappuccino, all the time. It doesn’t matter if there’s a gorgeous matcha latte on offer, or a chai latte, or a lovely flavor of tea, all of which I would love to enjoy; I just can’t pass up my cappuccino. Last week, my friend and I were sitting at the cafe, pondering this fact – she’s the same as me when it comes to ordering the same thing all the time! We ordered cappuccinos, but we both commented about another time we were at the cafe with someone else and they had ordered a chai latte, and it looked, and smelled!, amazing. As much as we wanted to order a chai latte for ourselves, we just couldn’t bring ourselves to do it. So we finished our cappuccinos and sat chatting for a while. Then my friend said, “You know what? We had our cappuccino, why don’t we just order a chai latte!!”! Haha!! “Sure!”, I said! And we finally had our chai lattes. This wasn’t the end of it, though. 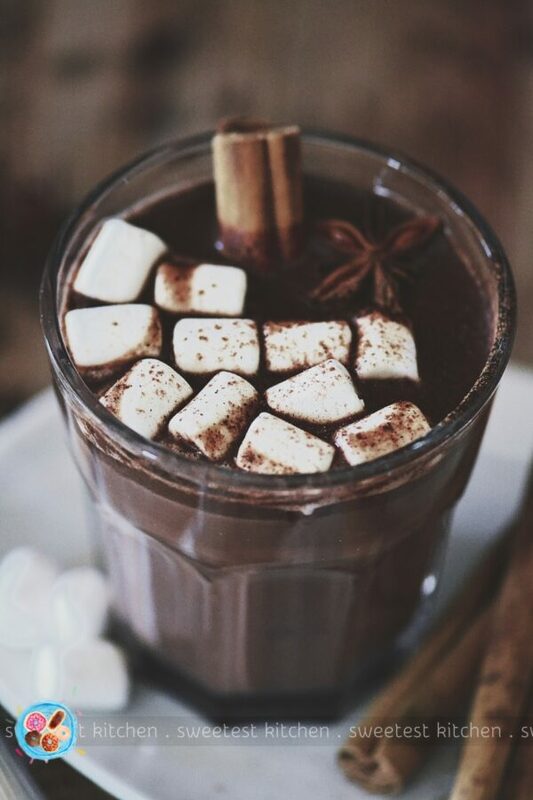 We began thinking of different ways to enjoy chai tea… one of those was with chocolate. The warming spices of chai tea in a hot chocolate sounded way too delicious and I just had to get to work on making this straight away. 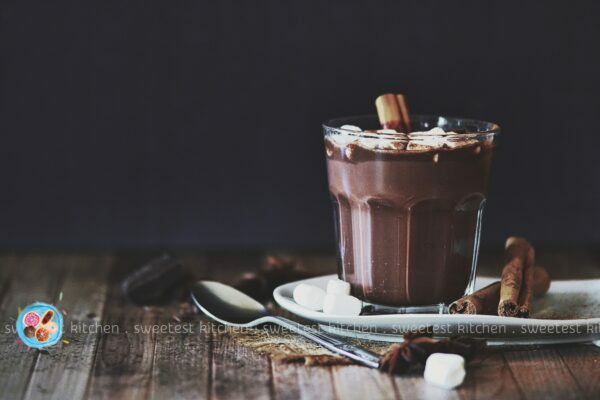 As always, creating a new recipe requires some research, so I browsed a few hot chocolate recipes from fellow foodbloggers and came across one from Modern Farmhouse Eats that looked both easy and delicious. I planned on making Rachel’s recipe for a flavor test and then doing some tweaking here and there on a second batch to make the ultimate hot chocolate. But once I made Rachel’s recipe, I couldn’t think of any way to improve upon it. It was absolutely perfect. 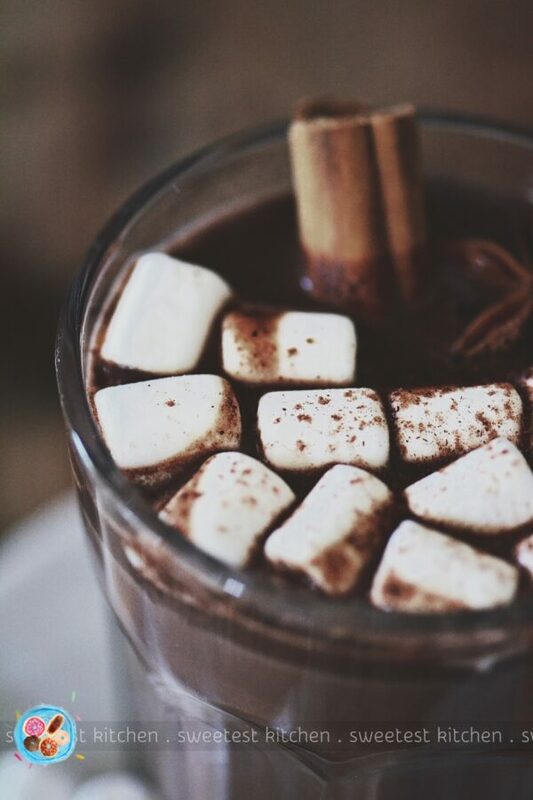 Everything I wanted in a chai tea-flavored hot chocolate was there. 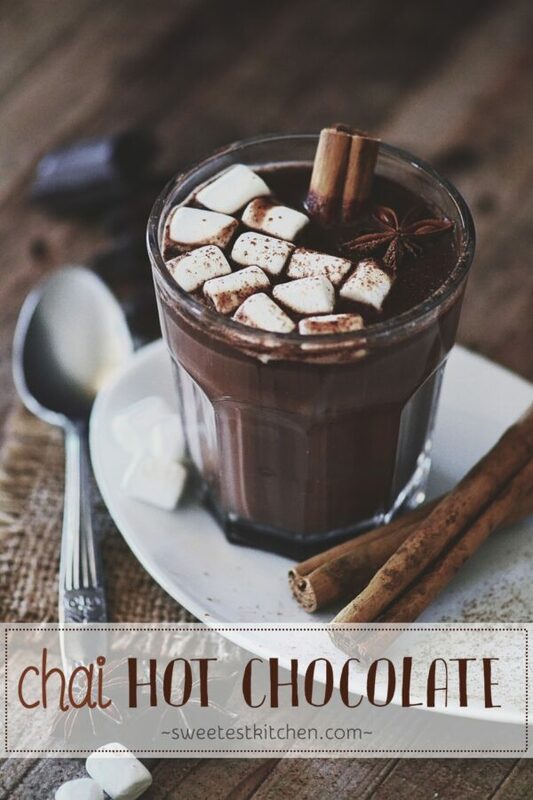 The thick richness of hot chocolate, the warming background of chai tea, the amazing aroma! Wow!! Well, actually, I did add just a little bit more chocolate than the recipe called for, and why not? I had enough leftover to share with my friends at school pickup that afternoon, which was the perfect opportunity to break out these tiny takeaway espresso cups! I adorned them with my logo, filled them up, topped them off with marshmallows and a dusting of cinnamon and handed them out to whoever was nearby at school. It was the perfect afternoon for it, too, since it was so cold and breezy! 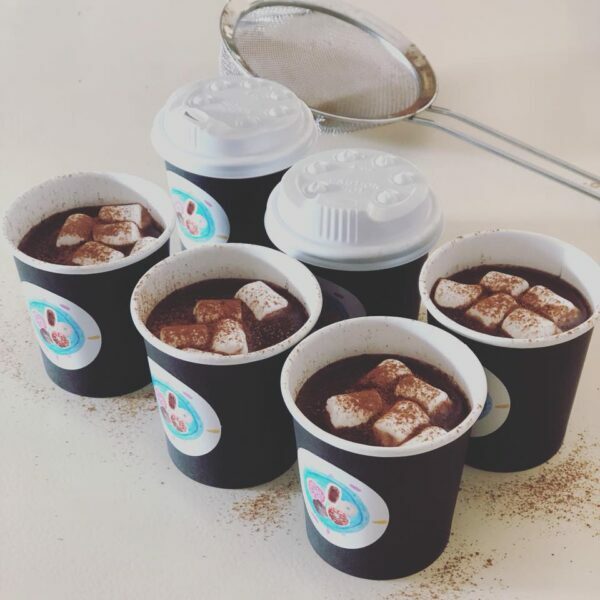 The chai hot chocolates were a big hit (of course!) and everyone loved them! I couldn’t leave my daughter out of sampling this amazing recipe, so I made another half-batch later on for us to share. She took a few sips, and I said to her, “It’s really good, isn’t it?”, and she replied, “I think heaven is real!”! Haha! This is the kind of warm beverage that you want to be in your mittened-hands while you sit around a crackling fire, enjoying the company of friends. Of course, if you’re reading this in the northern hemisphere, it may not be the right weather for that right now, but for us here in Australia, I couldn’t think of a better way to spend a chilly autumn evening! This recipe requires just six simple ingredients (plus water), hardly any prep time and is made in just one pan. All you’ll need to do is steep a few chai tea bags in boiling water, stir in a lot of milk and cook it just long enough, without boiling, to bring it to a perfect drinkable temperature. Then whisk in vanilla extract, cocoa powder, sugar and some chopped chocolate until it’s all combined. I made mine a little too hot, so while it cooled down in the pan, I tossed in some whole star anise and a cinnamon stick for added spice (inspired by the photos in Rachel’s post!). Of course, I removed these before serving! 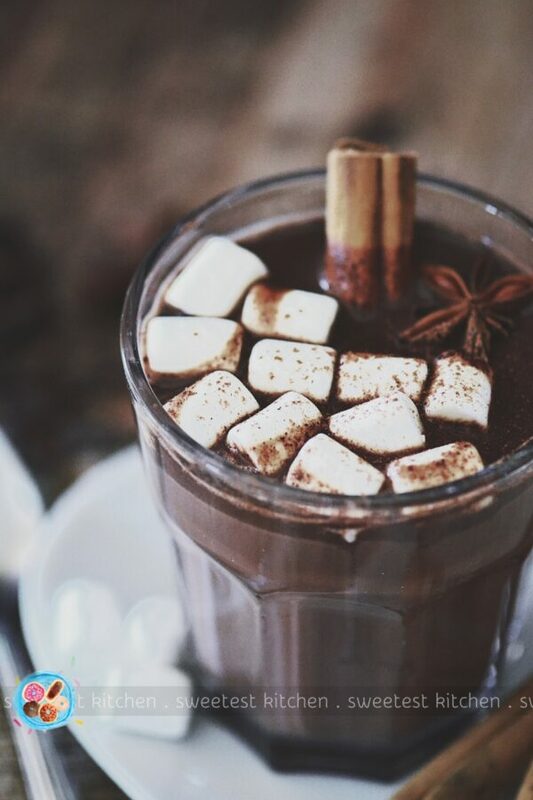 If you make this chai hot chocolate, be sure to let Rachel know how much you love it! It’s such a lovely recipe and I’m so happy she’s letting me share it with you today! I hope you enjoy it, too! So, what is your favorite drink to order when you visit a cafe? Or do you like to try something different each time? Let me know in the comments! Baby, it's cold outside! 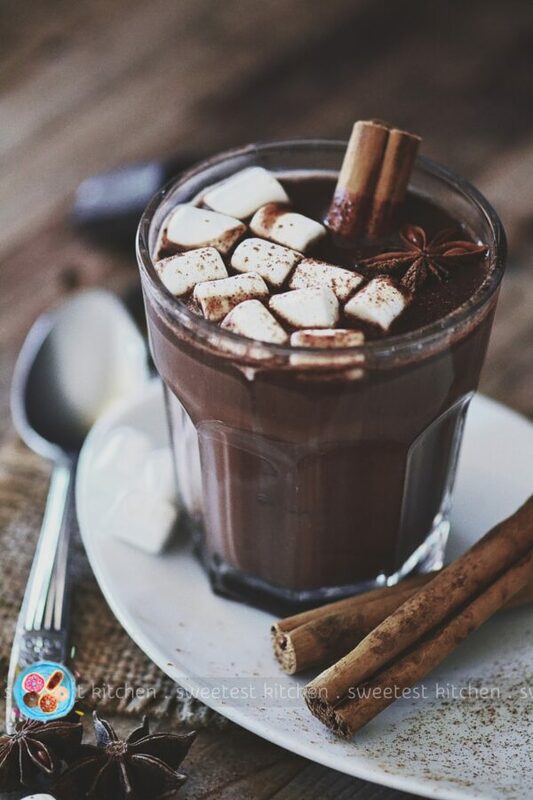 Grab a mug of this chai hot chocolate and gather round a warm, crackling fire for the ultimate winter-warmer! Pour water into a medium saucepan and bring to a boil. Remove from heat and add tea bags. Cover with a lid and let steep for 15 minutes. Add milk and stir. Leaving the tea bags in the pan, place over medium heat (do not allow to boil), whisking occasionally, until the mixture is steaming and at a hot, but drinkable, temperature. Note, if you have a gas stove, take care of the overhanging strings from the tea bags so that they don't come near the flame. Remove from heat and whisk in the remaining ingredients until thoroughly combined. Serve immediately with marshmallows (and/or whipped cream!) and a little dusting of ground cinnamon. 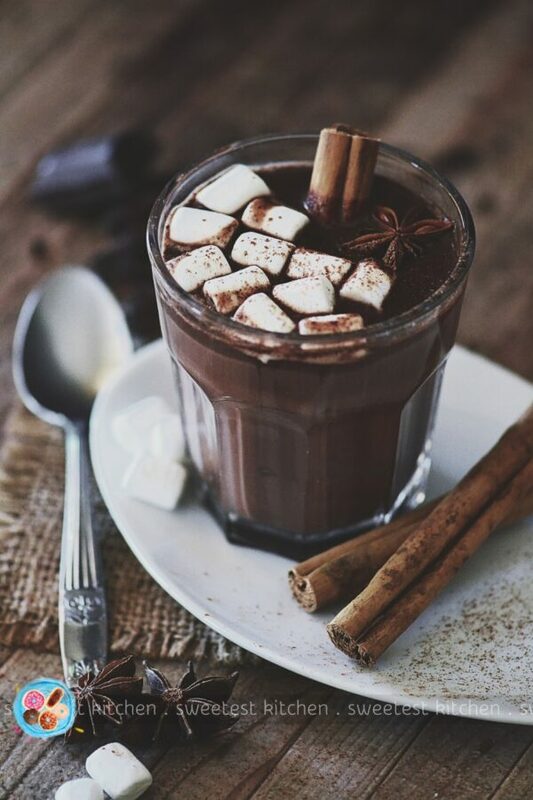 i’m in love with the darkness of this spiced hot chocolate. It looks and sounds divine.